On October 9, 2005, I invested in a TiVo. At the time, there were no DVRs. As far as I know, TiVo was the first digital recording device for television, and it actually worked really well. I decided to take the plunge and purchase a lifetime subscription. Boy did I milk that subscription! I broke even after 3 years, and then I just kept going. Sure, my TiVo could only hold about 20 shows at a time, and it wasn’t HD. But it was free! So I just kept going…until last week. 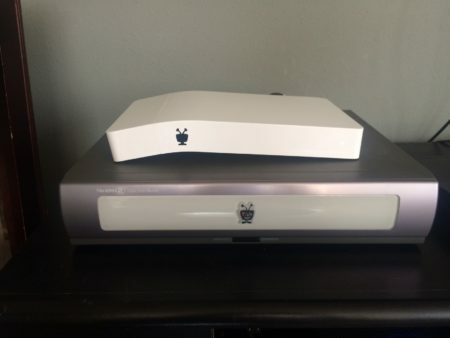 That’s when TiVo contacted me with an offer I could not resist: For a nominal fee (and the cost of a new TiVo), I could transfer my coveted lifetime subscription to the new device. Nearly 12 years after my original purchase, again I took the plunge, and with the help of a friend who is good at plugging things into other things, it was set up by Friday evening. It’s HD: I have 20/20 vision, and for the first time, I think I understand what it’s like for those of you who have supbar eyesight to put on glasses for the first time. HD is amazing! It’s so clear and crisp! Not only that, but if I’m on a non-HD channel, I can push a button on the remote, and it will automatically take me to the HD equivalent. It can record up to 4 shows simultaneously: This is something that rarely matters, but I have a few shows that conflict with each other, and always have to try to watch them online (Fresh Off the Boat and the recent Trial & Error). No more! Commercial Skip: When I’m watching a show and it reaches the commercials, instead of fast-forwarding, I can press a single button and it will jump forward to skip the entire block of commercials. It really is magical. Fast Play: I almost always watch YouTube videos at 1.25-1.5x speed, and now I can do the same with my TiVo. It has a “fast play” function that lets me watch any show–the audio and video fully synced and pitch corrected–at 1.3x speed. Yesterday I watched a 42-minute episode of The Expanse in just over a half hour. Netflix, Hulu, HBO Go, and Amazon Video all in one place: I used to have to sit at my desk to watch streaming video, but I end up dividing my attention between work and Stranger Things when I do that. Stranger Things deserves better. Now they’re all in my living room, where they belong. I adored my old TiVo, but I’m very grateful for the new one, and I look forward to the next 12 years with it. What’s the longest you’ve ever held on to outdated technology, and how did it feel if/when you upgraded? This entry was posted on Sunday, April 9th, 2017 at 9:11 pm	and is filed under technology and tagged with technology. You can follow any responses to this entry through the RSS 2.0 feed. I’m in the same boat with my TiVo! Except that now we rent an HD machine because the old one drove my husband crazy by not being HD. I refuse to toss the old box of my mom’s because it has a lifetime membership on it. Did they contact you by email? If so, could I ask that you send that to me, pretty please? I am super interested in doing what you did – When I looked into the new box before, they wanted a monthly subscription. My email is adoptarescuedog@aol.com. I’m SO EXCITED!